If you’re wondering if we’re going to recommend our real estate drone photography services in Los Angeles as a great way to help realtors sell homes, we’ll be candid — you’d be right. But who could blame us? Real estate drone video and drone photography are becoming the new standard for real estate marketing as a whole, and Jonathan The Drone Guy’s services are proud to be at the forefront of this trend. Actually, this couldn’t be accurately described as a trend — real estate drone marketing is the new best practice to market and sell properties around the world. Of course, any experienced realtor knows that marketing your listing(s) is only one part of the greater real estate picture. While leveraging our Los Angeles real estate drone photography services is vitally important to get your property out “on the map,” there are, of course, many components to the overall real estate success equation. Below, Jonathan The Drone Guy looks at a few common real estate best practices to help realtors sell listings in a realistic (and profitable) timeframe. If you’re wondering if using drones for real estate photography is right for you, Jonathan can help. Get in touch today to learn more! Your online listing may be enticing, but no one is going to seriously pursue a house that looks…less than desirable from the outside. By maintaining the yard, keeping the outside of the home clean, and showing that you care about how this home presents itself to the neighborhood, your clients are more likely to move forward with the home buying process. So, you’ve managed to entice the potential homeowner(s) into taking a tour of the inside to see it in person for themselves. Well done! Make sure that you have a well-lit, pleasantly-arranged living space, however — something that really paints the picture of what it would be like to live there. A dark, dingy interior just isn’t going to entice buyers into making moves. Everyone is on social media these days, and you should be, too. From popular channels like Instagram and Facebook to ads on Reddit.com, building an organic following and running paid ads are sure to generate some digital buzz about the properties you have for sale. Plus, the real estate drone video and real estate drone photography footage that Jonathan captures serves as ideal content to share on these social media platforms. If one of your listings has a beautiful deck, an expanded garage, a spacious patio, or an additional shed in the backyard, let your potential buyers know about these things! These items are only bound to help you sell the property in question. Contact Jonathan The Drone Guy Today To Get Started! 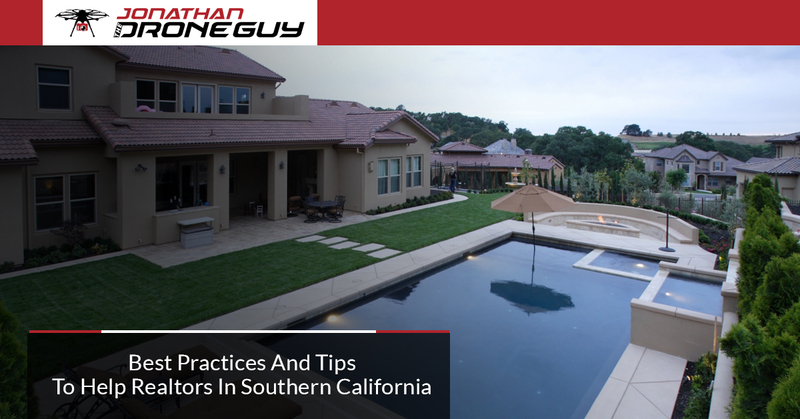 Don’t get caught behind the real estate competition here in Southern California. Get started with Jonathan’s real estate drone video and real estate drone photography services today! Learn More About Using Drones For Real Estate Here!